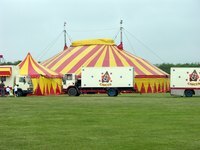 The circus is known for its brightly colored tents, performers, clowns and animals. Set up an area to look like a circus by creating a backdrop that incorporates common circus images and decorations. Use the backdrop as a set in a play or as a decoration in a classroom, circus themed bedroom or circus themed party. Create a backdrop by putting together a circus scene on a large piece of cloth or paper that you can hang up wherever you need it. Lay out a large piece of white fabric or paper on the floor in the area where you will be making the backdrop. The exact dimensions of the fabric or paper will vary, depending on where you plan to use it. Try to fill a whole wall with the backdrop, if possible. Unfold a plastic tablecloth to its full size. Cut the tablecloth into the shape of a circus tent with a triangular top. Cut a slit in the center of the tent coming up from the bottom to make a tent entrance. The tent should fill most, but not all, of your backdrop. Glue the circus tent to the white fabric or paper. However, do not glue the door flaps down. Roll back the door flaps of the tent to create a large triangular opening in the center of the tent. Hold the flaps back by poking a hole in the plastic tablecloth tent on either side of the doorway, threading a ribbon through the hole and using it to tie back the door flaps. Paint a picture of a clown or circus animal on the fabric or paper in the center of the doorway. If you need to, draw a basic outline in pencil first and use a picture of a clown or circus animal to get an idea of how it should look. Glue crepe paper stripes to the outside of the tent. The stripes should be in a contrasting color to the tent itself. Start one end of each stripe in the top of the tent roof, glue it diagonally out along the roof and then straight down the side of the tent. Paint additional clowns, circus animals and balloons on the white fabric or sheet in the space to either side of the tent. If you would like, you can also paint green grass on the ground and paint the sky blue.